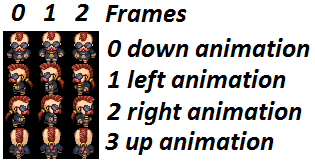 Sprites: Speed and animation. Android Game Programming 5. In this tutorial we are going to give to our sprite a random x and y speed. With this, the sprite will start with an aleatory direction that is going to change each time it reaches a border. We are going to use the Math.atan2(xSpeed, ySpeed) function to calculate the Sprite direction in execution time. atan2(x,y) gives the radian angle in double from (-PI to PI) but we just want an int result from 0 to 3 to know which animation we have to use. Lets consider the next graphic, I write the coordinates (x,y) for each direction that we have an animation: Up (0,-1), right (1,0), down (0,1) and left (0,-1). When the result angle is near to one of this direction we want to use the corresponding up, right, down or left animation. To do that I use Math.round function. Note: here x and y are xSpeed and ySpeed.